No matter which department leads your organization in delivering content to a global audience, it takes collaboration and the right tools to be effective. As content grows at warp speed, efficient content management becomes ever more crucial for a company’s success. Many groups in an organization own content and have great interest in maximizing its effectiveness. Marketers have a vested interest in what content is produced and positioned. Communication departments strive for agile delivery and consistent production. Technology teams work to establish various platforms and content delivery functions. Each has a unique perspective and a critical role in how content is created, managed, and delivered to an organization’s key stakeholders around the world. 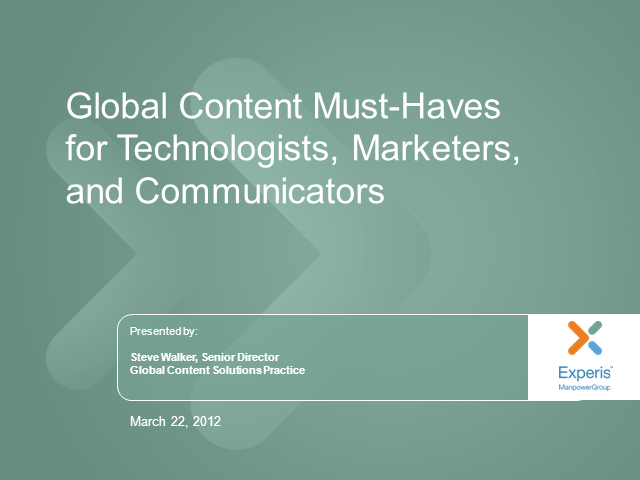 In this 60-minute webinar, we’ll examine best practices to managing your content for a global audience from three unique business perspectives. Experis will discuss the must have fundamentals for effective global content management to improve content effectiveness and reduce content management spend. Tips include how technology can streamline your content processes to save time and money, and how to integrate international talent pools for translations and subject-matter expertise.